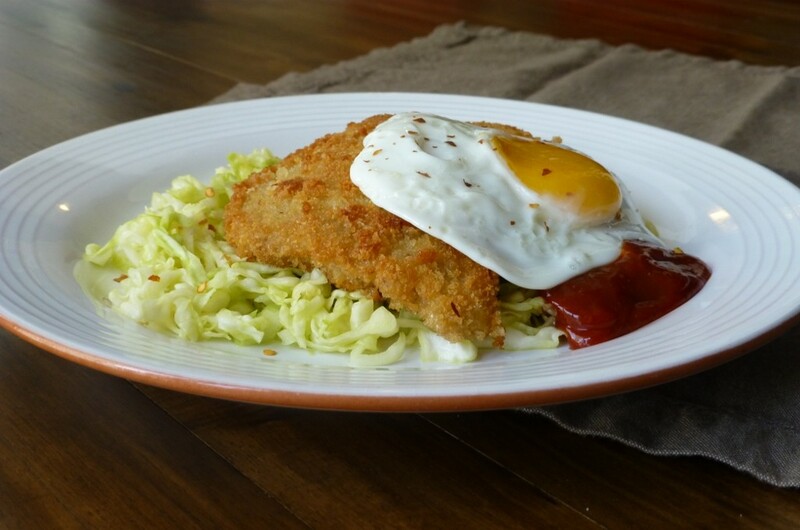 I like the contrasting flavors and textures – the sour/sweet of the pickled cabbage versus the spicy sriracha ketchup, the crispiness of the panko crust versus the velvety egg yolk. For some reason, I’ve been eating a lot of cabbage lately. I don’t know why. 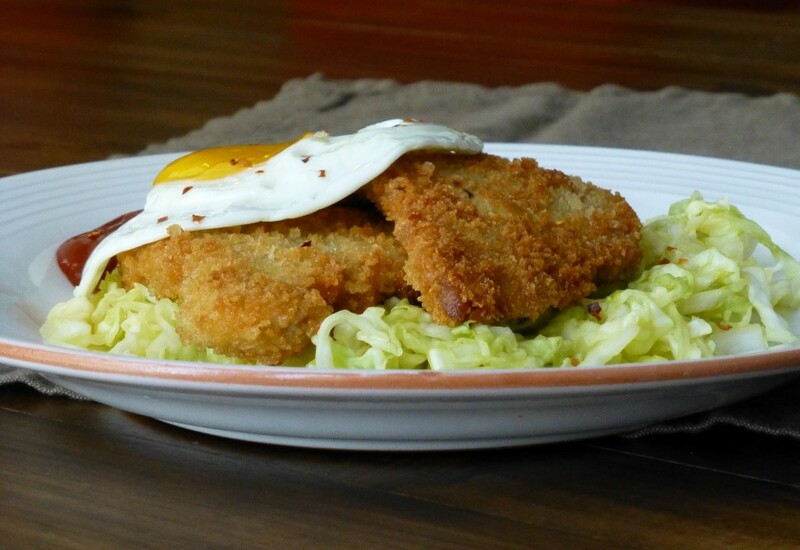 Braised cabbage, sauerkraut, coleslaw, pickled cabbage. I was never a huge fan before, but now I guess I am. What about you? 1. If the meat isn’t already pounded thin, do that first. Sandwich the meat in between two pieces of wax paper and smack it with a mallet. 2. Take out 3 shallow bowls. 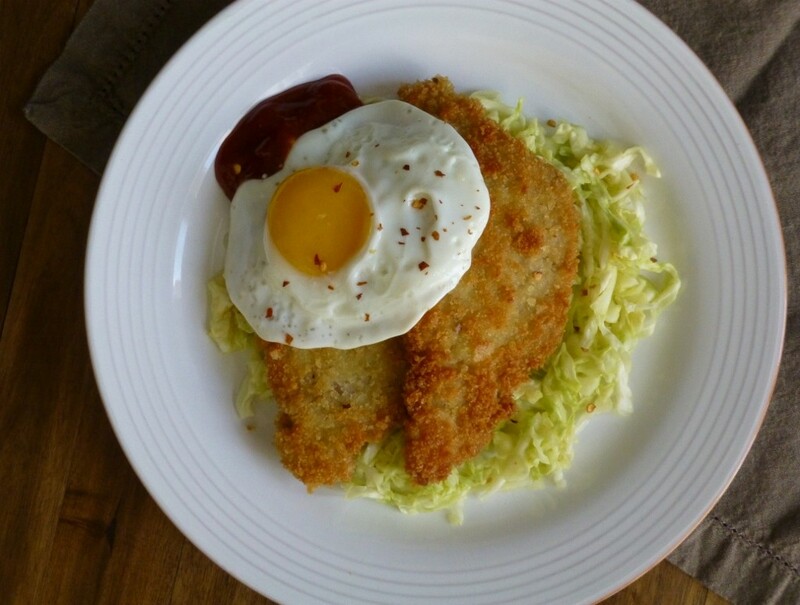 Put flour in one, eggs in another, and panko in the last. 3. Salt and pepper the meat. 4. Dip in flour and shake off excess. 5. Then dip in egg and shake it again. 6. And finally into the panko. Bread both sides. Twice to get it really coated. 7. When you have all the meat ready, heat a pan with oil (the oil should fully cover the bottom of the pan). Toss a pinch of panko crumbs in to test if the oil is hot. When they start dancing around, add in the meat in a single layer (you may need to do two batches). Flip only once when you see the edges browning about 2-3 minutes. The other side will take a little less time. 8. Drain on a rack or on some paper towels. Finish with a pinch of fine salt. This one’s easy. Mix it all together. Done. Yay! 1. Slice the cabbage in half. Cut out the core at the bottom. It should come out if you make two angled cuts around the outside of it. 2. Cut the cabbage into thin strips. 3. Toss it in a strainer with the salt and let stand for 20 minutes in the sink. You’ll notice the salt start to draw out the moisture in the cabbage and the cabbage will become wet (which is why you want it in a strainer in the sink). 4. Meanwhile, bring the vinegar, sugar, bay leaf, and peppercorns to a boil. It will smell like you’re dyeing Easter eggs. When the sugar is dissolved, take off heat and strain out the bay leaf and peppercorns. 5. When cooled, pour into a long shallow tupperware container. 6. Rinse the cabbage (another reason it’s in a strainer in the sink…) and add to the vinegar solution. Press down with a spatula. It should just cover the cabbage. 7. Refrigerate for at least 4 hours, although it’s best the next day.